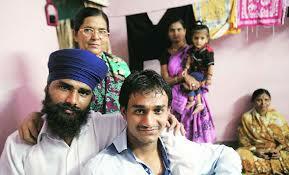 SMM Buzz: After Eleven Years FACEBOOK Reunites Gurubaj Singh with His Family!!! After Eleven Years FACEBOOK Reunites Gurubaj Singh with His Family!!! This story can be a typical bollywood movie. And the hero in this movie is none other than facebook! Yes, only because of facebook one family is reunited! This is the story of Ankush alias Gurubaj Singh. He left his home at the age of 13 after being beaten up by his mother and uncle. 13 years ago Ankush so called Gurubaj Singh now, tried to ride his uncle’s new bike and ended up with an accident. His mother and uncle have beaten up him very badly for damaging the bike. Later his mother threw Rs.50 note at him and said never want to see his face again. In angry Gurubaj left home and survived somehow with the help of so many kind people. Finally, he was settled in Gurudwara in Ludhiana and converted in to Sikh. But, he missed his home, mother and his younger brother very badly, and started searching for his family online. Luckily, Gurubaj Singh found his younger brother Santosh on facebook and messaged him “I am your brother. Call me” The message sent by him got prompt response from the family. His family is settled in Pune. Finally Gurubaj came to Pune from Ludhiana to join his family. And all credits goes to social media giant Facebook.